The global version of the HTC One S ($200 with a new two-year contract from T-Mobile; price as of April 18, 2012) impressed me at Mobile World Congressback in February, so I was anxious to see if the T-Mobile version was equally awesome. Spoiler alert: It is. The One S packs a high-end camera, the latest version of Android, and a powerful dual-core processor in a swank, superslim design. Among its few drawbacks is the absence of a microSD slot; in addition, we had some issues with the call quality in San Francisco. The models in HTC's One line of phones have three common features: a high-quality camera with HTC ImageSense, built-in Beats Audio, and a premium design. We've always praised HTC phones for being both easy on the eyes and well-constructed, but the One S takes phone design a step beyond that, with a classic aluminum unibody design that incorporates contrasting slate and blue-gray panels. The sealed battery cover of the HTC One S.
The aluminum body has been given a "micro-arc oxidization treatment," which is apparently the same treatment that NASA uses on satellites. Besides making the One S supertough, it gives the phone a futuristic look. According to HTC, the One S is so tough that you won't need a protective case, but I'm going to counter that. You always need a protective case for your phone, no matter how tough the manufacturer claims it is. Furthermore, that satellite aluminum is slippery and difficult to get a grip on when you're holding it in landscape mode. Several times while I was using it to snap photos, I felt as though it was about to slip out of my grasp. The camera lens has a bright blue ring around it, a stylish touch that makes the One S stand out. And when you remove the SIM card cover cover, you'll see more of that blue inside the phone. Little design touches like this are what make HTC phones stand out from the legions of all-black rectangular smartphones. One downside to the design is that the battery cover is completely sealed. As with the iPhone 4S, you can't remove the HTC One S' battery. Let's hope that your battery stays intact throughout your two-year contract, because replacing it might be a big pain. The HTC One S is ultra-thin. According to T-Mobile, this is the carrier's thinnest phone yet. The One S measures 5.1 by 2.5 by 0.31 inches. The One S is thus slightly thicker than the Motorola Droid Razr Maxx (0.28 inches) but a bit thinner than the Apple iPhone 4S(0.36 inches). HTC's minimalist design leaves no unused or excess space. The Gorilla Glass, which protects the display, goes almost to the edge of the phone's chassis, with a small space for the phone's speaker. Below the display, you'll find the three standard Ice Cream Sandwich touch-sensitive buttons: Back, Home, and Recent Apps. Screenshot of the color scale test on the HTC One S.
The 4.3-inch qHD display (540 by 960 pixels) has the same resolution as the HTC Sensation 4G, also on T-Mobile. This resolution is lower than 720-by-1280-pixel Super IPS LCD 2 display on the top dog of the One line, the HTC One X. The Super AMOLEDtechnology makes colors look bold and details sharp, for the most part. In our color bar test, I detected a fair amount of oversaturation. Colors bled into one another, and it was hard to distinguish one color shade from the next (see the example images). Super AMOLED fares better than LCD displays in sunlight, but it was still hard to see the One S's display. Love it or hate it, HTC Sense--the manufacturer's user interface over Android--is here to stay. Android 4.0 (Ice Cream Sandwich)has, by far, the best-looking interface of any version of Android. 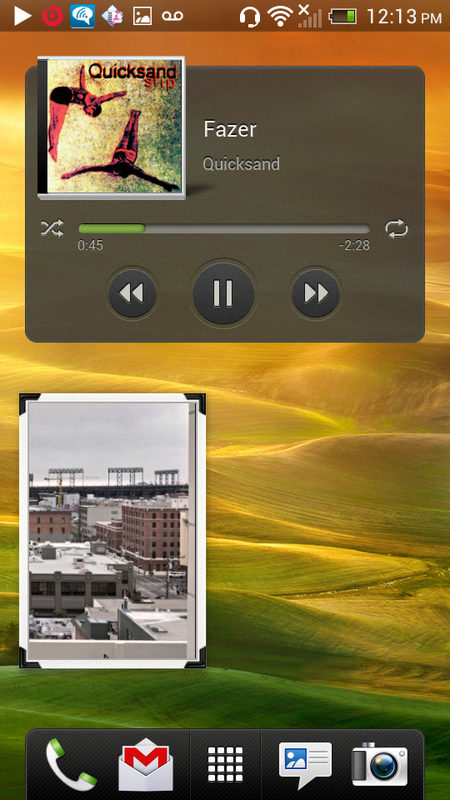 I understand why manufacturers slapped on overlays in the early days of Android: The underlying interfaces were ugly. And HTC Sense is undeniably pretty. But those animations and colorful widgets have a tendency to bog down the operating system. Perhaps my idea that manufacturers might leave Android 4.0 alone and just add a few customized widgets was just wishful thinking. To HTC's credit, Sense 4.0 is much subtler than previous versions of the interface. The company has cleared out a lot of unnecessary icons and text that cluttered older versions of Sense. You can still pinch the screen to see all seven of your homescreens, and you get that handy customizable lock screen that we saw with Sense 3.0. Still, Android purists might take offense to a few changes. The Recent Apps UI has been tweaked in typical Sense fashion. Rather than displaying your apps or websites as a list with thumbnails, it displays them as pages that flip as you flick through them. The Sense widgets are a bit too busy and garish for my liking, but you can easily remove them. HTC puts a bunch of extra software on the One S, which is unsurprising given that bloatware--er, added software--seems to be the norm these days for smartphones. I could disable most of the uninvited apps, but not all of them. As I mentioned earlier, HTC emphasizes camera technology in its One smartphone line. All One phones have the HTC ImageChip, which supports an f2.0 aperture and a handful of different shooting modes, including High Dynamic Range (HDR), Macro, and Panorama. HTC also claims that One cameras have an almost no-lag shutter speed. In my hands-on tests, I found the no-lag claim to be pretty much true. My photos taken in automatic mode looked excellent, with good colors and crisp details. Most of the shooting modes worked quite well, too, especially the marco mode (see example photos). HDR made my photos look a bit funky--I prefer the HDR mode on the iPhone 4S's camera. You can also add Instagram-like filters to your photos, but I don't think they look very good. A better bet would be to add a third-party app like, well, Instagram or Pixlr, which has even more filters. Overall, HTC has done a great job with the One S's still camera. It could certainly fill in for a stand-alone camera. The video camera looked just okay. My test video looked a bit shakey and it has a bit of a dark cast. Before you start loading music, apps, videos, and other content onto your One S, know this: You're capped at 16GB of internal memory. That sealed back means you have no access to a microSD slot. Expandable memory is something that most Android phones have over the iPhone and Windows Phones, in terms of hardware. So when an Android phone maker decides not to include a microSD slot, I have to wonder why. My suspicion is that HTC wanted to keep the One S as slim as possible, and that adding a microSD slot would have added some bulk. If you can't work with a 16GB limit, there is some good news: One S owners get 25GB of Dropbox storage, which is free for two years (the length of the carrier contract). Dropbox is integrated throughout the phone's user interface in apps such as the photo gallery; so, for instance, you can snap a photo and then upload it directly to Dropbox. As someone who uses Dropbox for practically everything—from moving music around to sharing documents—this is a big deal for me. All HTC One phones have Beats audio built in. Beats audio automatically turns on when you play music, but you can opt to turn it off. I could definitely hear a positive change in music quality, especially with rock and metal music, when Beats was running. Bass sounded richer and the vocals sounded fuller. Beats audio also kicks in when you play a YouTube video. Video not only looked great on the One S's display, but it ran smoothly too. In my hands-on tests, the HTC One S actually crashed and restarted. The crash occurred when I was opening an attachment and taking a screenshot of it. As soon as my phone restarted, I got a message in the notifications window informing me that the phone had sent an error report to HTC. I wasn't able to replicate the error, however, and I never had any other instances where the phone crashed or froze--so hopefully this was just a one-time thing. Powered by a Qualcomm S4 1.5GHz dual-core processor, the One S felt speedy and smooth throughout the user interface. I also tested the One S using two different benchmarking apps. On Qualcomm's own Vellamo benchmarking app, the One S scored 2365, putting it ahead of the Samsung Galaxy Nexus, our top-ranking phone. On the third-party benchmarking app Quadrant, the HTC One S scored a 3451, again ahead of the Galaxy Nexus. To test gaming performance, we used both the Egypt version and the Pro version of GLBenchmark 2.1. We ran the tests first with antialiasing on and later with antialiasing off, repeating both tests three times and averaging the results to produce four different scores, measured in frames per second. The HTC One S turned in average frame rates of 60 frames per second with antialiasing off and 59.6 fps with antialiasing on. By comparison, the Galaxy Nexus had average frame rates of 42.5 fps with antialiasing off and 23.4 fps with antialiasing on. In my hands-on tests of graphics-heavy games like Anomaly Warzone HD, World of Goo, and Osmos, the One S ran flawlessly. This is a superb gaming phone. Using the FCC-approved Ookla Speedtest.net app, I tested T-Mobile's HSPA+ 42 network in various parts of San Francisco. On those tests, the HTC One S delivered surprisingly slow data rates: an average of 4.27 megabits per second for downloads and 2.48 mbps for uploads. According to T-Mobile, the review unit we received was not configured for the HSPA+ 42 network and "these are not the speeds consumers will experience." One of my friends reported that my voice sounded "digital" while another said that I sounded very distant. A few of my friends noticed that my voice was "breaking up" a bit on a few calls. Call quality was hit-or-miss. One of my friends reported that my voice sounded "digital" while another said that I sounded very distant. A few of my friends noticed that my voice was "breaking up" a bit on a few calls. On my end of the line, my friends sounded okay, but I could hear some static in the background. We have not yet completed our formal battery tests, but we will update this review once we obtain the results. In my hands-on use, the fully charged battery held up over an entire day of moderate-to-heavy use. The HTC One S is the best phone on T-Mobile and one of the top Android phones overall for any of the four big carriers. Both AT&T and Sprint are releasing versions of the HTC One X, which has a bigger, higher-resolution display and LTE connectivity. Hopefully the call quality issues I experienced with my test HTC One S are an isolated incident. Phones can do a lot more these days than simply make calls, but call quality remains an important element to consider when buying a smartphone.